With the renewed emphasis on singing the Propers at Mass, Anthony Corvaia's setting of Ego sum vitis vera is particularly appropriate. The text is the Communion Antiphon for the Fifth Sunday of Easter [Jn 15:5]: "Ego sum vitis vera et vos palmites qui manet in me, et ego in eo, hic fert fructum multum, alleluia, alleluia." and is translated: "I am the true vine and you, the branches; whoever remains in me and I in him, this one bears much fruit, alleluia, alleluia." The motet is written for SAB voices and is mostly homophonic, with greater use of polyphony in the Alleluia section which ends the work. Comfortable ranges: Soprano: middle C - F / Alto: middle C - C / Baritone: B - middle C, makeWith the renewed emphasis on singing the Propers at Mass, Anthony Corvaia's setting of Ego sum vitis vera is particularly appropriate. 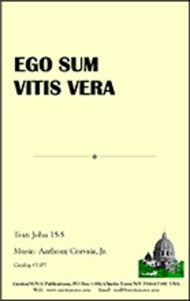 The text is the Communion Antiphon for the Fifth Sunday of Easter [Jn 15:5]: "Ego sum vitis vera et vos palmites qui manet in me, et ego in eo, hic fert fructum multum, alleluia, alleluia." and is translated: "I am the true vine and you, the branches; whoever remains in me and I in him, this one bears much fruit, alleluia, alleluia." The motet is written for SAB voices and is mostly homophonic, with greater use of polyphony in the Alleluia section which ends the work. Comfortable ranges: Soprano: middle C - F / Alto: middle C - C / Baritone: B - middle C, make this motet very useful in parish settings. Most appropriate for the Fifth Sunday of Easter, this would also make for a suitable choral offering throughout Eastertide. this motet very useful in parish settings.